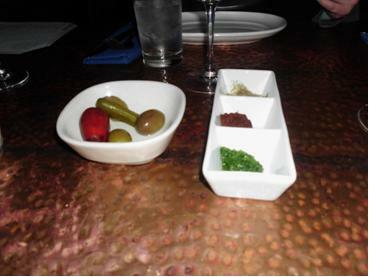 TWSF’s Penn State liaison, Caroline, recently went on a date to Zahav, an upscale Israeli eatery located in Philadelphia's Old City. Shortly after the meal she shared her excitement about her dining experience with us, and we promptly gave her an assignment to write a review. Not long after Caroline's journey to Philly Magazine's #1 restaurant, we found ourselves making reservations there during Thanksgiving weekend. Carloine and TWSF had different experiences (a la carte vs. a tasting menu) so we decided to do a combination review presented in two servings. First Course: Caroline's account of ordering a la carte followed by the Second Course: our account of Zahav's tasting menu. Enjoy! 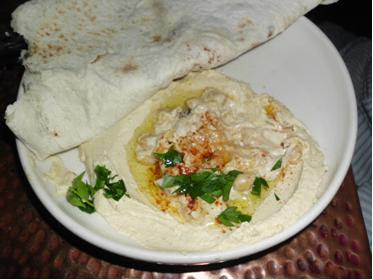 "Though we struggled to make a decision on the hummus and laffa, we ultimately decided to go with the classic: hummus masbacha, or hummus with warm chickpeas. We found the hummus portions generous, and after a day of walking around Philly, Jon and I gobbled it up. 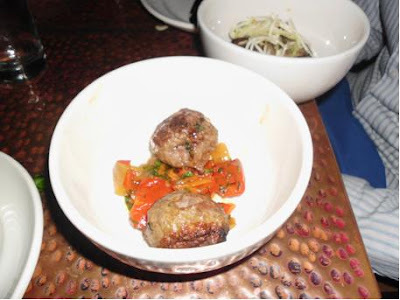 We split the Farsi and the Bulgarian and found each dish to contain interesting flavors and both were satisfying. The cozy atmosphere of Zahav lends it to date nights or an evening for a few close friends. Highly recommend!" Chuck whisked me away on a romantic train ride into Philly the Saturday after Thanksgiving. It was freezing, but that didn’t stop us from having an amazing time walking through the streets of Philly, making a pit stop at Eulogy bar, and heading to Zahav. The restaurant is just off bustling Walnut Street, making it perfectly located for a before and/or after dinner drink. It's dimly lit offering a romantic touch, and there is a view of the chefs swiftly moving about the kitchen preparing authentic Isreali cuisine. After much debate, we opted for the Mesibah (or “party time”) tasting menu. When going to a highly rated restaurant, we find it best to leave decisions to the chefs and suggest that you do the same. Zahav's tasting menu promised salatim and hummus with laffa, a selection of mezze, a whole-roasted lamb shoulder with pomegranate and chickpeas, and the choice of one dessert. Our waiter prepared us that this was going to be a lot of food, and boy was he right. We won’t talk about the hummus too much because Caroline already covered that, but damn it was good. And that laffa, ugh I really wish I could make that at home and use it with everything. The salatim was incredibly interesting, 8 small salads each providing an entirely different taste and introducing us to many preparations of veggies. For the selection of mezze, we specifically requested that one of them be the Crispy haloumi (sheep’s milk cheese, apple, pomegranate, serrano) because I had read rave reviews. I was happy to find that our server and chef graciously obliged, and served us a fantastic dish. I absolutely loved loved loved the fried cauliflower (labaneh with chive, dill, mint and garlic), and will attempt to make this at home sometime, although Chuck wasn’t thrilled by it (I should point out that most vegetables don't "wow" him). We were served a very dainty salad, and something else but I honestly can’t remember what it was (9 out of 10 ain’t bad). Once our plates were cleared, our server gave us an “are you ready for this?” look and revealed an impressive lamb shoulder, piled with goodies. 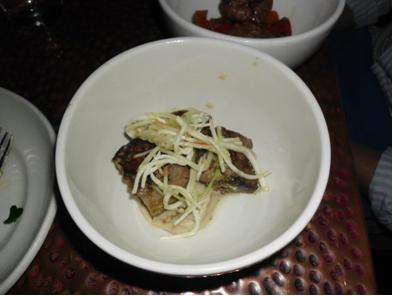 The lamb was perfectly cooked and fell apart with the touch of a fork. The chickpeas, OMG they were awesome. They were so, crunchy. I’ve never had a chickpea cooked quite like it. They were a pretty purple color, likely from being braised in pomegranate juice. Everything was served over a bed of crispy Persian rice. We were stuffed by the end of the main course, and started forcing bites down our throats for fear that we would not have a lamb and chickpea dish such as this again. As you can probably guess, neither of us had much room for dessert, but it came with our menu so who were we to say no? By the time dessert was served the bottle of wine we ordered had gotten the better of us, so we can't recall the nuances of our final course. However, I do remember it tasting really good and feeling bad that we only took a couple of bites from each delight. 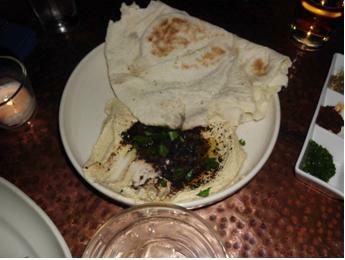 Zahav was a perfectly romantic dinner date...we will be back! Holy smokes I miss laffa. Shawarma wrapped in laffa, probably my favorite street food ever.